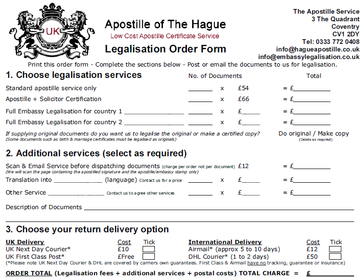 You can order your apostille online today or post an order form to our office. We can legalise your documents for just £54 including all fees. Documents must be signed of stamped by a recognised person or body before the apostille can be issued. If your document has a recognised government signature, stamp or seal, or has already been signed by a solicitor then it will be a standard document with 'apostille only'. Other documents will need to be checked and signed by our solicitor before we can issue the apostille. Please see the document list below. Documents that are stamped, signed or sealed by a recognised official. Documents that need to be checked and certified by our solicitor. You can select your service below, pay online and post your document to us with your order confirmation. We can legalise all UK documents. Those listed above are for guidance only. Please contact us if you need to clarify which service you need or visit our prices page. If you prefer to place your order using a paper application you down download and print our paper order form. Most company documents can be emailed to us including certificates of incorporation, memorandum and articles of association. Please email your documents to us for clarification. You can scan and email our order form too. Alternatively provide your contact details in the email and we will contact you for payment. Simply print the order form and post your documents to us. We are happy to process a wide range of company documents by email. We can also verify some degree certificates electronically (additional fee will apply). Your contact details will not be passed to any third parties. We will only contact you to discuss your order. No sales calls or marketing emails will be sent.